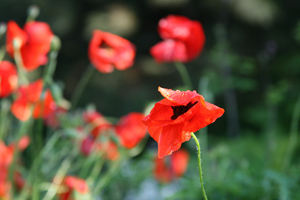 Oh, and there’s something about poppies too… these are in the botanical garden right near our house. I thought you all might be ready for a change of background! I used up the larger pieces I had left for this abstract design. I really think it’s fun (as you already know, I think it’s so fun that I started another which will have this type of design as the front). This entry was posted in [search] Square-in-Square Quilts, 2009 Finished Quilts, Finished Quilts, Household Sewing - bags, napkins, pillows, Posts about Quilts, Quilts. Bookmark the permalink. both are amazing!!! the fabrics are really beautiful!!! These are wonderful. I love the backs as much as the front! I just found your blog last night, I will be visiting often. Just as great as the first. What a great pair of quilts! Cute, cute stuff! I luv it! Well done! I like them both! The fabrics just go so well together! So pretty!! the colors on these quilts are amazing!! I love them both. They each have unique looks. So great! Those would look great on two beds side by side! You could get the full effect that way! Thanks for sharing! They’re both stunning 🙂 You really crank out some amazing quilts – you’re my hero! I LOVE it!!! Girl, you have me so inspired!!! 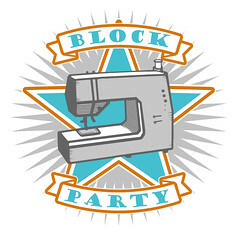 Fraternal twin quilt blocks! How beautiful. i agree- the second one is my fav, but they are both beautiful! Oh they both look so good!! And you know I’m right there with you with the obsession with squares! They look awesome! I love them both, but my favorite is still the bento box one! 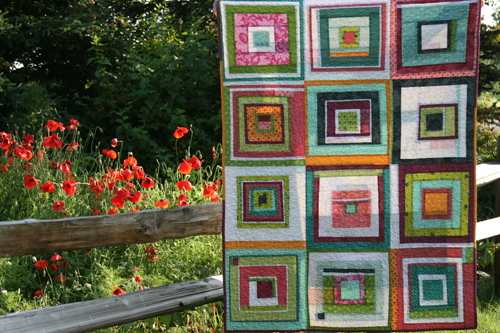 I love love love these quilts! So cool together, too! My next quilt is going to be your ‘bento box’ idea for sure, its my favorite of the two. Gorgeous quilts! I love them both! They are beautiful – I loved the bento box one but now I have to say the square one is my favorite – and the back is just amazing! I absolutely love them both … front and back. sometimes i have those days.. where i want a room with 2 beds… or a certain layout.. just for a quilt.. and i don’t think its makes us crazy… just dreamers!!! and i love them both… but the 2nd is better! Very nice indeed. I like them both. <3 them both!!! Though my favorite is the second. I also believe you know someone with two twin beds in the same room, hahaha. Love them! Looking at the piece of FMF blue seeds makes me even more crazy for that fabric! 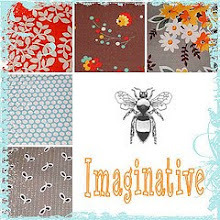 Your fabric selections are amazing and the designs . . . WOW! maybe you will have twins! They both look so good side by side! Very nice finish and I love the side by side comparison. I think I like the second one better too! They are both wonderful. I am really liking these square modern designs especially with white. Of course it doesn’t matter…who needs twin beds to show of twin quilts! They both look fantastic…another beautiful job. i seriously love your work. love it!! and they look amazing together, and agree that they would be great as twin quilts in a room together!! 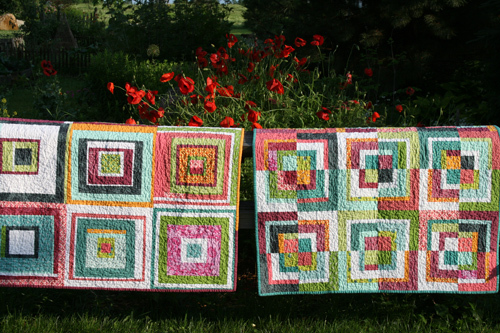 what type of quilting did you do on these quilts? they look so crinkley and lovely! All so lovely! 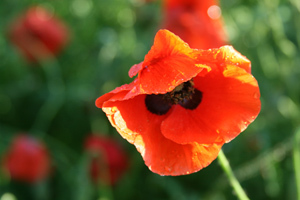 Those poppies are inspiring me to make something in red and black. 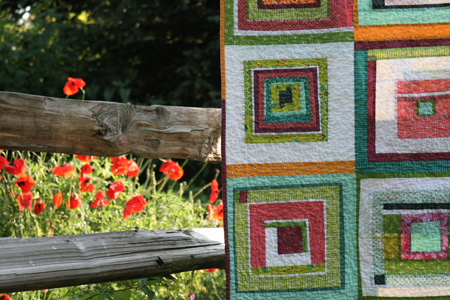 I really love your quilts–fabrics, patterns, everything! I’m amazed by how prolific you are. I haven’t come across any discussion of how you do the quilting. Do you use a regular machine or a long arm? I find quilting anything larger than a baby quilt on a regular machine to be challenging, so I would love to hear about your experience and any tips you might have. They are both wonderful! And the poppies too! Adorable and perfect – as usual! Love these! What a cute pair! The color palette for these quilts is just fantastic. I wish I was able to pull together various lines/colors of fabric like this. I hope to make a bento box quilt like this sometime this year. I love, love, love (stole that phrase) your photography! The subjects, backgrounds, angles, and clarity are all fabulous! Oh and the quilts they’re pretty darn unbelievable! You continue to amaze me. Oh man, those quilts are GORGEOUS. My oldest two are boys and they share a room. I’m inspired to do something like this! !Thanks you so much for the inspiration!! I love ALL of your quilts! RE: the second time around quilt. Did you just randomly cut strips as your went when you made the squares? 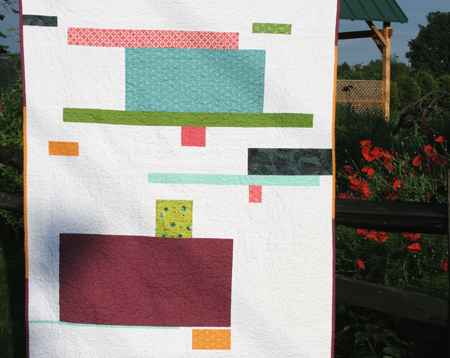 I am also very anxious to make a strip pieced quilt from your tutorial. You are so inspiring! HELP! How much fabric do I need for a Modified Bento Box! I have it picked out; 12 lights, 12 darks 🙂 But don’t know how much I need to get enough!